The Stations begin at West Washington Ave and Henry St. Our Cathedral, the main church of the diocese and seat of the bishop, burned down by arson in 2005. 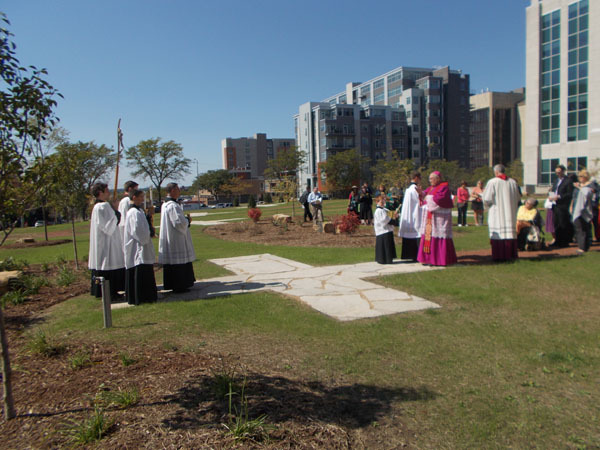 In the interim, the remaining buildings on the site have been razed and 14 landscaped Stations of the Cross with a crushed red granite path connecting limestone crosses, flush to the ground so as to be vandalism-resistant. 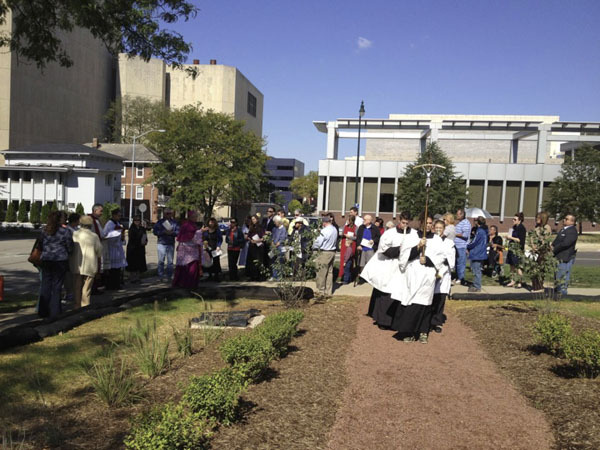 It was a gloriously lovely day today for the blessing and dedication of the Cathedral property that again has a religious use and beautifies Madison. His Most Reverend Excellency Bishop Morlino! Behind him is the wonderful rector of the Cathedral Parish, Monsignor Kevin Holmes. This picture makes me happy the longer I look at it. 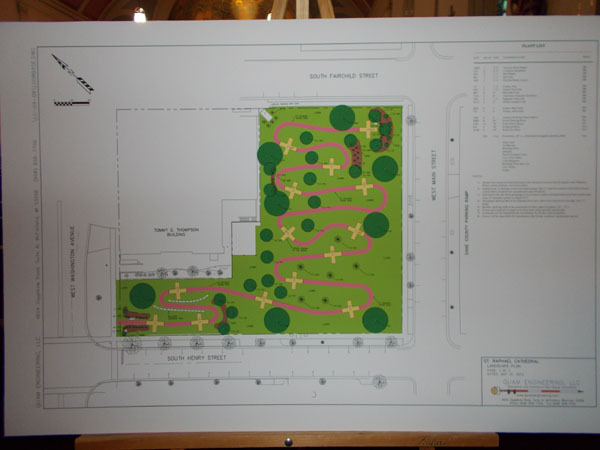 Here’s the landscape architect’s plan, so you can visualize this. This is one block off of Madison’s Capitol Square. At each of the 14 large Crosses you stop and pray commemorating one of the events of the day of Jesus’ crucifixion. There are a large number of different versions of the Way of the Cross prayers, which originated with the experience of Holy Land pilgrims actually walking the “Via Dolorosa” in Jerusalem in the footsteps of Our Lord and Redeemer when He went to His death. One traditional version of the prayers is that of St Alphonsus Liguori. Another popular version is Blessed John Paul II’s Scriptural Stations of the Cross. Over 50 people turned out. This photo of the start of the procession looks toward West Washington Ave which is behind the people who are on the sidewalk, and Henry Street is on the left. 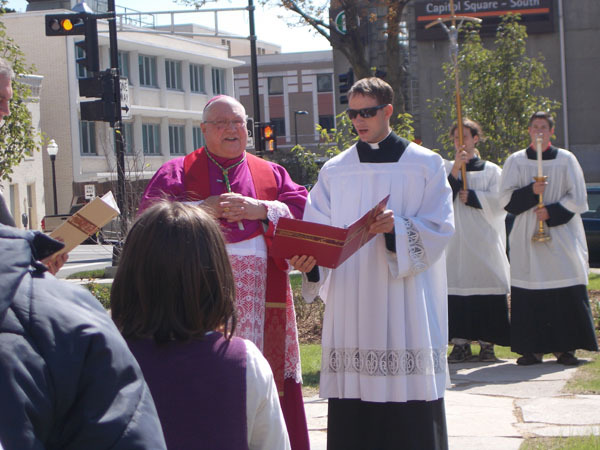 This photo credit to the Diocese of Madison via facebook (go “like” them, too!). Bishop Morlino spoke to us strongly before blessing the Stations, about defending our religious freedom and the contemporary phenomenon of Crosses being taken down from public places, by aggressive secularists who want to exclude any religious expression from the public sphere. The Cross is the sign we Christians are known by, he said, and must be visible. Here our dear bishop is blessing the 5th Station. 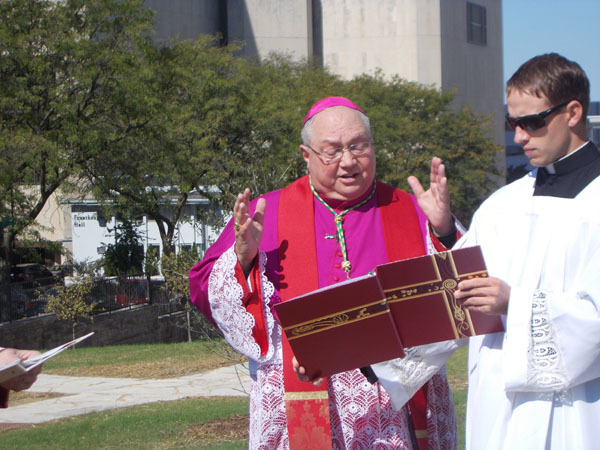 Looking cool in sunglasses is his Master of Ceremonies, Fr Greg Ihm. To get to a new Cathedral, we are going to have to walk the way of the Cross, he told us. This is at the last Station. A sad sight, St Raphael’s Cathedral after being gutted by the 2005 fire, which also collapsed the roof. See the Madison Catholic Herald’s coverage of St Raphael’s Cathedral fire and aftermath. 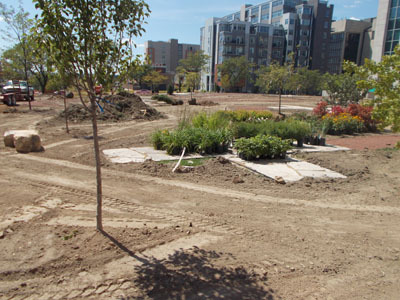 This photo obtained on the website of the National Trust for Historic Preservation. 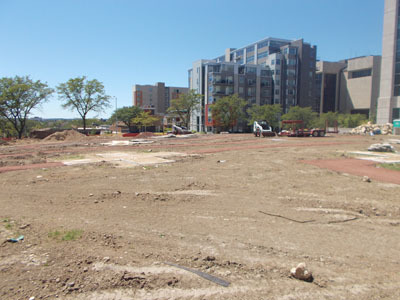 St Raphael’s site in spring of 2012. 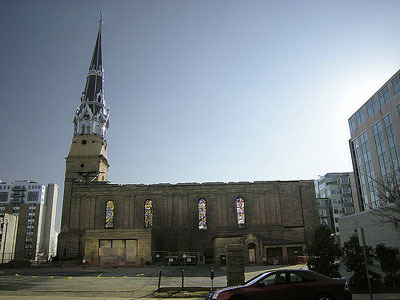 The Cathedral itself, which had occupied the space in the foreground of this picture, was demolished in 2008. The steeple can be seen in storage in a parking lot along East Washington Avenue. Madison firefighters did some training in the remaining school and rectory buildings prior to their demolition this year. Beginning to tear down the school and rectory. 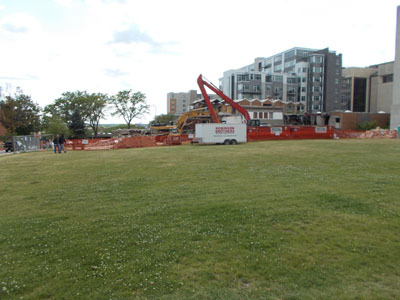 The buildings have been leveled and the rubble mostly removed. Can you tell this is when we were having such a drought this summer? 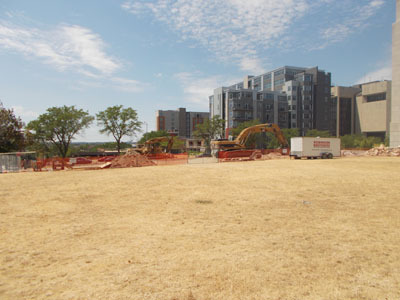 Very soon, the work was underway for the site’s new look. On its way to being something beautiful again! 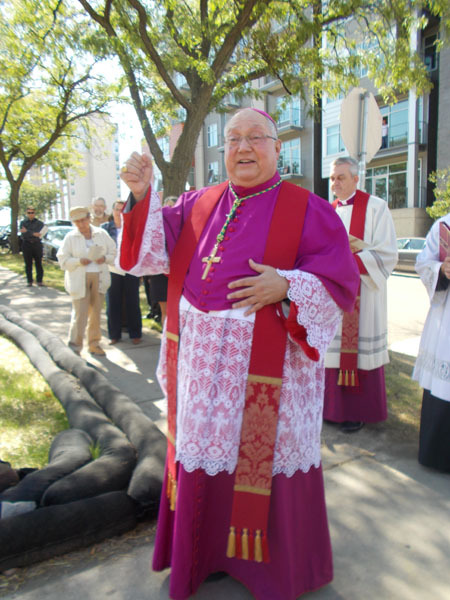 Bishop Morlino blesses the 14th Station, today, September 14th. 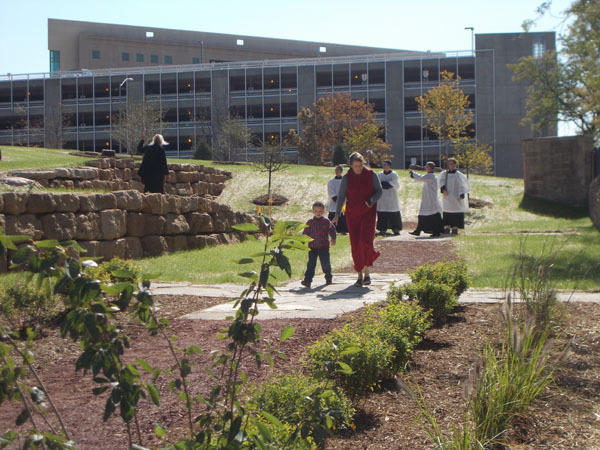 The large stone blocks you can see scattered here and there among the landscaping are, poignantly, burnt stones from the old Cathedral. Next on this site: the resurrection of our CATHEDRAL. Let us pray perseveringly for that, and let us sacrifice with much love of Jesus and His Church! 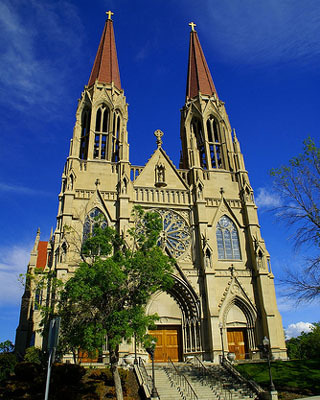 This photo is stunning St Helena’s Cathedral in Helena, Montana, which was Bishop Morlino’s see before he came to Madison. 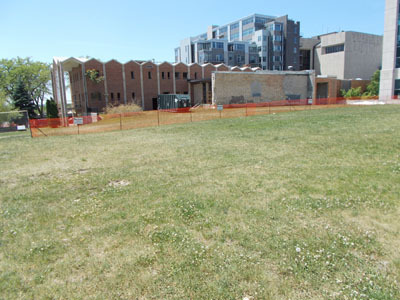 The future Cathedral is planned to face this way on the lot facing Fairchild St, as represented by St Helena’s, and be larger than the old one. There’s a connection with the Feast of the Exaltation of the Cross. St Helena was the mother of the emperor Constantine (4th c) and is credited with finding the True Cross on which Our Lord was crucified in Jerusalem. Bishop Morlino blessed us with a relic (a tiny piece) of the True Cross following the blessing of the Stations. This photo by Shannon Sorg copyright 2010 via Flickr. I believe people will want to pray these Stations on a regular basis, particularly on Fridays. I look forward to that. I won’t be surprised if there aren’t throngs of people, but I could imagine that some people might go over there together after 5:15 Friday Mass at Holy Redeemer Church, or 5pm Mass at St Paul’s. It is also something to do on the lunch hour. I can also imagine people who aren’t necessarily Christian walking the path and pondering. May they seek the truth. The new Stations of the Cross are meant to be to all an invitation to faith. I always thought that wooden crosses were required to be present for canonical stations of the cross (images are optional, but usual). Also, at the dedication and blessing of these Stations, we were accompanied by a 1st class relic of the True Cross, that would seem to count for more than just any old wood crosses!